Braehead Community Garden (BCG) is a member of the UK Men’s Shed Association. Members, or “Shedders” can work on their own projects or get involved with community projects, helping maintain green spaces or building things for schools, libraries or individuals in need. Activities in Sheds vary greatly depending on what activities shedders wish to pursue, but could include woodworking, metalworking, repairing and restoring, electronics or model building. Sheds attract people of all age and skill levels. The Men’s Shed Movement originated in Australia in the 1990s and has since spread worldwide. 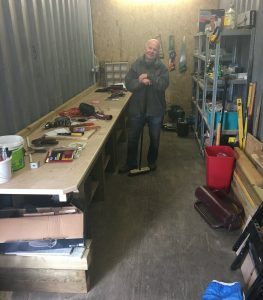 Men’s Sheds are similar to garden sheds – they are a place to pursue practical interests at leisure, to practice skills and enjoy making and mending. The difference is that garden sheds and their activities are often solitary in nature, while Men’s Sheds are the opposite. They’re about social connections and friendship building, sharing skills and knowledge, and of course a lot of laughter. The movement may be called “Men’s Shed”, but at BCG, the shed is open to everybody. There can be men’s, women’s and mixed sessions. There can be sessions for mending, session for using wood, sessions for electronics – the facility is only limited by the imagination of members.